Denver's police union is fighting back against the district attorney's decision not to prosecute the city's two top officers, reports KMGH. 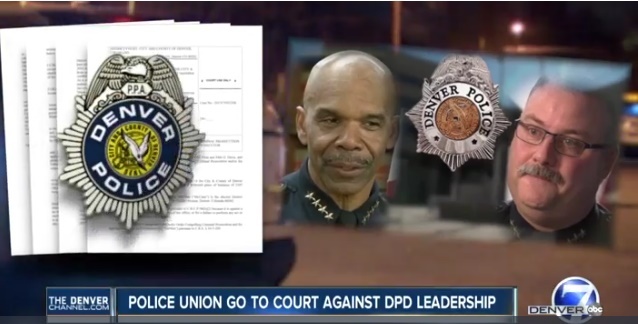 An attorney for the union filed a motion in Denver District Court Wednesday afternoon asking a judge to force the prosecution of Denver Police Chief Robert White and Deputy Chief Matt Murray for alleged violations of the state's open records law. Last month District Attorney Beth McCann announced she would not seek misdemeanor charges against White and Murray, calling their actions careless but saying there was not enough evidence to prove they intentionally violated the law. In its motion Wednesday, the union asked a judge to either order McCann to file charges or appoint a special prosecutor to handle the matter. The dispute stems from the department's initial failure to release a letter that harshly criticized Murray written by the former district attorney, Mitch Morrissey.